24. John Roberts4 THOMAS (William Rees5, Rees6)(42) was born in Scranton, Lackawanna County, PA, February 8, 1865. He died January 28, 1923 in San Diego, San Diego County, CA, at 57 years of age. His body was interred in the Thomas plot in Forest Hill Cemetery, in Dunmore, Lackawanna Co., PA. He married twice. He married Sarah Anne HARRIS circa 1885. She was born November 18, 1865. She died August 24, 1896 at 30 years of age. Her body was interred in the Thomas plot in Forest Hill Cemetery, in Dunmore, Lackawanna Co., PA. Sarah's occupation: Homemaker. He married Della Protheroe EVANS in Philadelphia, Philadelphia Co., PA, December 17, 1898. (43) She was born near Gibson, Susquehanna County, PA March 7, 1861. Della(44) was the daughter of Daniel Jonah EVANS and Sarah PROTHEROE. She died May 4, 1941 in Scranton, Lackawanna County, PA, at 80 years of age. She was buried next to her father in Forest Hill Cemetery in Dunmore, Lackawanna Co., PA. Della's occupation: Homemaker. John R.'s occupation: General Agent for Evans & Thomas Insurance Agency in Scranton, Lackawanna County, PA, until his death. John R. Thomas was eight years old when he went to work in the mines as a breaker boy. In 1890 he was appointed a letter carrier in Scranton by Postmaster D. M. Jones, and served in that capacity until July 1, 1900, at which time he purchased the controlling interest in the Evans & Thomas insurance agency. He served as a member of that firm until his death. 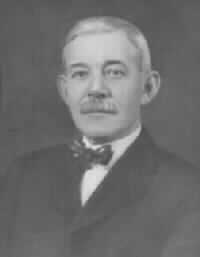 He was a Republican and served as president of the select council under Mayor Dimmick's administration, and was on the committee of three men that selected the official flag of Scranton. He held membership in the Plymouth Congregational Church, Masonic Lodge, Knights of Pythias, Knights of Malta, Loyal Knights of America, and Scranton Club. He was a director of the Lincoln Trust Company, and vice president and director of the Ralph E. Weeks Corporation. 25 i. Chester Arthur3 THOMAS was born in Scranton, Lackawanna County, PA, December 23, 1887. He died August 21, 1963 in Elmhurst, Lackawanna County, PA, at 75 years of age. His body was interred in the Thomas plot in Forest Hill Cemetery, in Dunmore, Lackawanna Co., PA. He married Mary Victoria EVANS in Scranton, Lackawanna County, PA, September 10, 1913. She was born in Scranton, Lackawanna County, PA November 3, 1889. (45) Mary was the daughter of David Daniel EVANS and Margaret UNKNOWN. She died 1976 in Scranton, Lackawanna County, PA, at 86 years of age. Her body was interred in the Thomas plot in Forest Hill Cemetery in Dunmore, Lackawanna Co., PA. Mary's occupation: Homemaker. Chet's occupation: President of The Wesel Company in Scranton, Lackawanna County, PA.
+ 9 ii. Everett Daniel THOMAS was born April 4, 1901.